I recently saw Robert Rodriguez and James Cameron’s would-be sci-fi blockbuster Alita: Battle Angel. Amidst its dystopian future world of robots and jet skates, one piece of world building stood out to me: a cyborg busker shredding on guitar with the assistance of a third cybernetic arm. I’m embarrassed to admit that I spent the next few minutes zoning out in the theater, thinking of the competitive advantage a third arm would give me in my favorite games. I could hammer out Street Fighter combos with the speed of E. Honda’s Hundred Hand Slap, or build complex encampments in Fortnite with the swift precision of a military unit constructing fortifications. 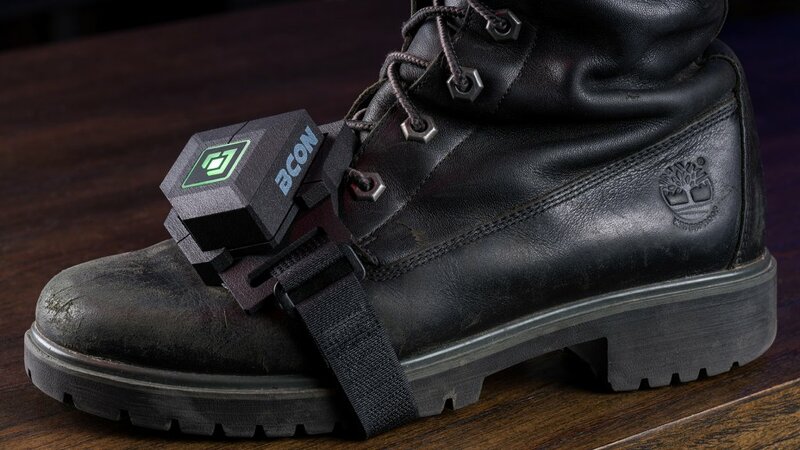 I may not get my robot arm anytime soon, but the Bcon Gaming Wearable may just be the next best thing: at its core lies a high-precision motion sensor that lets you trigger keystrokes with a flick of your foot. I got the chance to test it out to see if it could turn me into the superhuman gaming machine of my dreams. Designed and engineered in Germany with crowdfunding support on both Indiegogo and Kickstarter, the Bcon is an innovative wearable PC gaming controller that lets you game with your feet. Now I know what first comes to mind when the phrase “gaming with your feet” comes up, and I don’t mean like this, or like this either. Rather, the Bcon provides an elegant control scheme based on tilting your foot front, back, left, and right to trigger various customizable inputs. What these inputs are is totally up to the user; Bcon’s configuration software lets you map up to twenty-four keyboard keys to motions, depending on how far you move your foot. With so many command possibilities, the Bcon needs good motion control tech, and that’s where its 3-axis tracking system comes in. The dual-sensor system inside the wearable tracks 1,000 movements per second, so inputting a command is as simple as tapping your foot; you’re never left flailing around trying to get something to happen. The Bcon hardware itself is small and inauspicious; in my testing, I barely would have noticed it was there if not for its haptic feedback that vibrates when you trigger a keystroke. This feedback is useful since the Bcon includes a “Protection Zone” feature that prevents unconscious movements from triggering inputs. This Protection Zone is a window of about 5° in which you can shift your foot without issues. Go outside the window and the Bcon will vibrate to let you know that you’ve registered a command. The Bcon magnetically slots into the included foot strap, which in my experience kept it firmly affixed even when making exaggerated foot movements. Using the Bcon is a wire-free experience which give players the optimal freedom to move around. Ditching the cords means that the Bcon connects over Bluetooth, meaning you’ll either need a computer with Bluetooth built-in, or invest in a Bluetooth adapter. I personally used a cheap USB Bluetooth adapter for my tests, which worked perfectly fine. Some PC gamers may be wary of wireless peripherals because of the potential for bad input lag, but in my tests I encountered no such issues; commands always seemed snappy, registering near-instantaneously. Even in timing-critical games like fighters, I didn’t have a problem pulling off moves when I needed to. A color-changing LED on the Bcon serves as a status indicator (i.e. glowing cyan for pause mode, blue for being paired with a device, and white for data transmission). When the LED begins flashing red, you know it’s time for a recharge. Speaking of which, the Bcon is powered by a battery that offers six hours of continuous gameplay and is rechargeable over micro USB. In my time with the Bcon, I found the manufacturer estimate of six hours to be accurate, even when I would use it constantly throughout gameplay. If you want to keep tabs on the battery before getting the low-battery LED notification, there’s another solution: the Bcon configuration software. The Bcon configuration software lets users create their own control schemes and fine-tune the range of motion needed to trigger each keystroke. 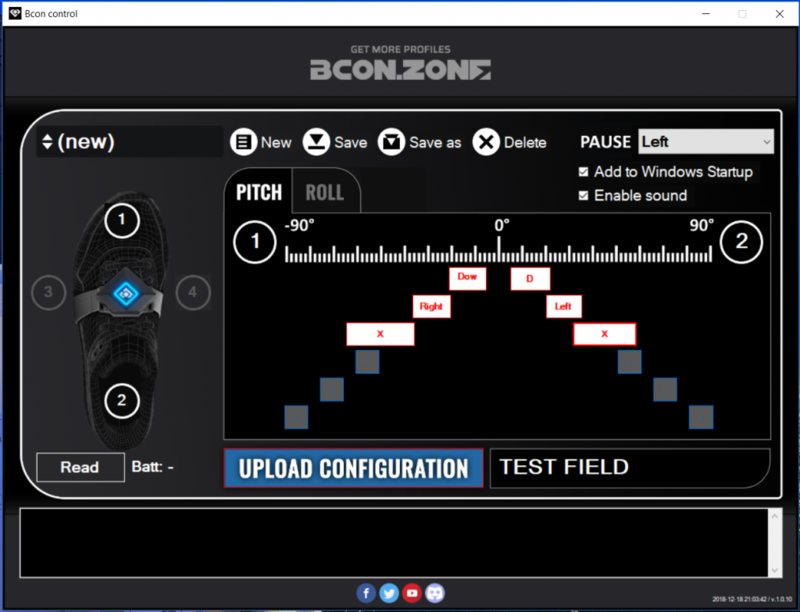 Bcon’s configuration software lets you map button inputs to the pitch and roll of the Bcon, pitch corresponding to tilting your foot forward and back, and roll denoting a tilt from side to side. The software also allows users to map 24 keys to the device, six for each 90° tilt (forward, back, left, and right). In addition, you are able to tweak how far you’ll need to move in order to trigger a certain input, either by manually inputting the range of motion (i.e. moving between 20° to 35° to trigger the spacebar), or by dragging the inputs’ corresponding box on the configuration software. If creating your own configurations sounds too intimidating, the Bcon website hosts a portal of player-made configs for such titles as Fortnite, Grand Theft Auto V, and PUBG. You can either download these control schemes and load them into the configuration software, or merely view their control settings for inspiration in designing your own set of controls for those games. Besides control configuration creation, Bcon’s software also lets you monitor the battery life of the Bcon and choose a key for “pausing” the wearable. Pausing will suspend any inputs until pressing the pause key again, at which point the Bcon will calibrate itself to your foot’s current position. The best part of the pause feature is that it can be activated in the middle of games, so you can recalibrate your position on the fly if you want to shift around a bit or kick your feet up. Anyone with experience waggling a Wii Remote or flailing in front of a Kinect is probably at least a little wary of motion inputs. I was skeptical of the prospect of the Bcon delivering precise inputs from the movement of my foot after being burned by the motion control craze of the previous console generation, which proved to be more hype than substance in most cases. But motion controls have come a long way since then, and manufacturers are more adept at avoiding the pitfalls and lofty promises of motion controls’ old guard. After spending a few weeks with the Bcon, I can say that it is very much a part of the new wave of motion controls, focusing on what can be done well with motion sensing tech, rather than overreaching – you tap and flick your foot to simulate keystrokes rather than strapping a Bcon to each foot in an attempt for one-to-one movement with your in-game avatar. My first experience with the Bcon came when the Newegg Studios team generously let me use one of their beefy PCs to try out Apex Legends with the aid of the gaming wearable. Once I downloaded the configuration software, it took me a bit of time to get a handle on how to map my desired controls, but once I came up with a satisfactory control scheme, I threw myself into battle. I set up the Bcon to handle actions that are a pain for me to handle in the heat of battle. As this was my first time using the Bcon, I kept things simple and mapped one key per direction: crouch was mapped to lifting my heel, reload to lifting the front of my foot, and tilting on each side switched my weapons. I found each input registered flawlessly; within minutes, using the Bcon for my mapped commands came naturally to me, keeping my mind focused on the game. Sure, I still played terribly made my teammates angry, but I can’t blame the Bcon on that. I’m just lousy at Apex. My initial tests with the Bcon sparked my curiosity for how I could use it in games I’m more familiar with. I took it home, installed the configuration software on my home computer, and plotted ways for the Bcon to supplement my games. I’ve tried many times to get into Fortnite, but the building mechanics always held me back from being any good at it. Snipers catching a glimpse of me through their scopes would be likely to find me awkwardly fumbling around with building materials – trying in vain to construct a ramshackle stairway and instead dropping a wooden roof on the ground – before squeezing a couple rounds into my poor character’s head. Bolstered by my promising experience with Apex Legends, I had faith that the Bcon could improve my play in its battle royale. It seems that another Bcon user had the same idea as me, because one of the most popular user configurations on Bcon’s portal was for Fortnite building shortcuts. Pitching to the front engaged wall mode, pitching back triggered stairs, rolling left activated floors, and rolling right was for trap mode. With these easy motion control shortcuts in my arsenal, I was ready to show the millions of Fortnite players what a master architect looked like. Unlike Apex Legends, I already had a decent amount of experience racked up playing Fortnite; building was the only elusive mechanic for me. So I’m pleased to report that the Bcon significantly improved my play. No longer did I find myself fumbling across my keyboard, getting shot while searching for the right material; everything I needed was just a twitch of my foot away. Instead of devolving into an anxious mess, I handled firefights by deftly building up fortified structures, toggling between the best materials to keep me safe as I regrouped. I didn’t become a pro or anything – I have yet to attain a single Victory Royale – but using the Bcon represents a clear line in the sand in my evolution as a player. Simply put, I can’t imagine going back to a keyboard for building after the simple control of the Bcon. Since I had such a good time playing Fortnite with the Bcon, I figured I would try out a fighting game next. This would be a trickier prospect: unlike Fortnite or other shooters, it was difficult to think of a useful one-button-per-direction control scheme I could make for a genre dependent on multi-button movements and combos. That meant it was time to get a little more ambitious in creating my control configurations. A spark of inspiration came to me while I played King of Fighters ‘98 against the AI and thought about how unfair of an advantage CPU opponents have in most fighting games (especially games like KOF, which is so infamously tilted against the player to have spawned the term “SNK Boss Syndrome”). As I lost for the twentieth time to my computer-controlled opponent, after being blasted by inhumanly rapid special moves and counters, I felt that the Bcon was the tool I needed to even the odds. I took to the Bcon configuration software and mapped out various special moves to the four directions of movement. For instance, I mapped out the keys needed to throw a fireball to two directions of foot pitch – to compensate for which side of the screen my character would stand – and played a couple fighting games with my new foot controls (the fireball motion is fairly universal across fighting games). I didn’t quite get the results I wanted initially though. In many games, special moves need to be inputted within a special timing window, so I first needed to play with the Bcon configuration software to find the right timing window for each keystroke to register. Once I found one that worked, I was on a roll. Now that special moves were no longer a hassle for me to pull off, I was free to actually focus on my technique. I still got wrecked by CPU bosses, but I actually won a few online Street Fighter matches just by throwing some fast fireballs and uppercutting whenever my opponents jumped near me. You may say that’s cheap, but a win’s a win! My head teeming with inspiration for improving my play in all sorts of genres, I decided to see how well the Bcon worked in combo-based character action games. I booted up Metal Gear Rising: Revengeance and set to work on creating a new Bcon configuration for tapping out the more complex combos. 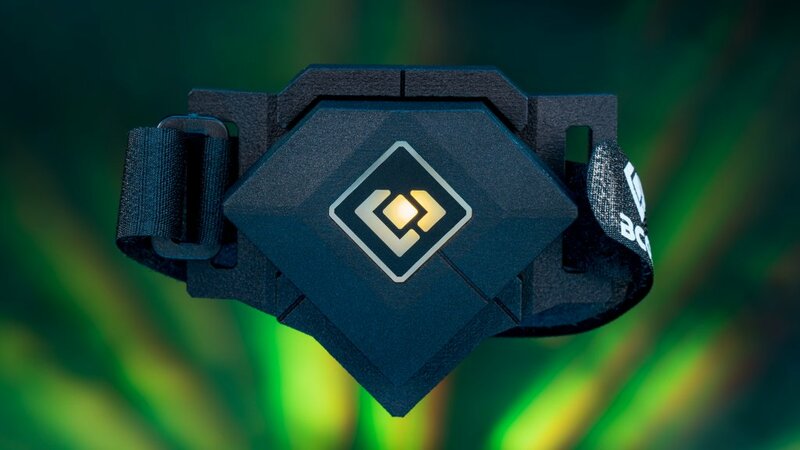 This was the only part of my time with the gaming wearable that let me down a bit, though I should stress that it’s not really the fault of the hardware as much as my lofty expectations. Due to the precise nature of inputs in these sorts of games, designing macro-like keystrokes and pairing them with with rapid motion controls doesn’t really work. Even with tweaking the amount of room between keystrokes, I still could only perform the first couple moves of a five-part combo. In other words, I would temper your expectations if you expect the Bcon to turn you into an expert demon hunter in Devil May Cry 5. With some further adjustments in the configuration software, however, you may have better luck than I did. 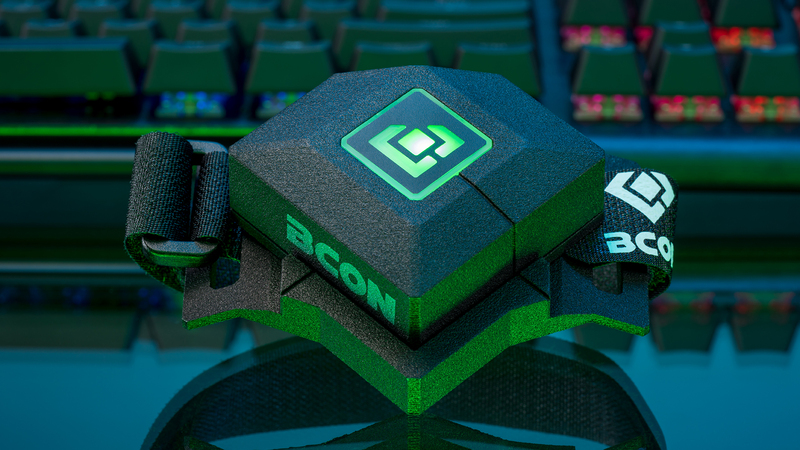 It may not be exactly like getting a new appendage, but the Bcon gives you more options for control than many other add-on gaming peripherals. 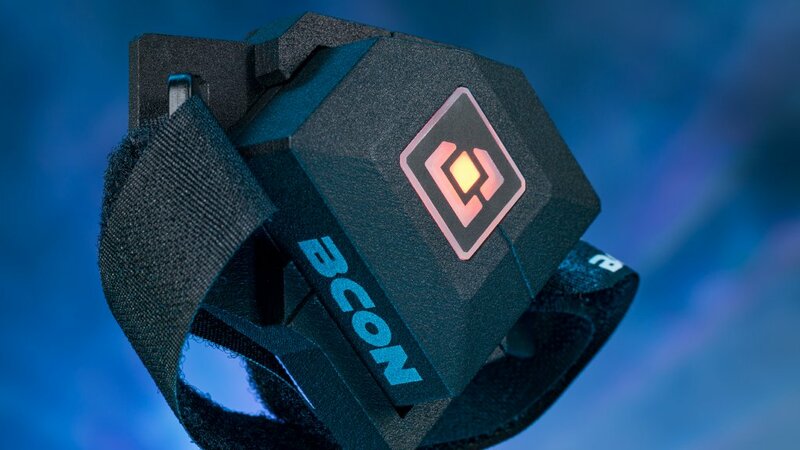 This is no 21st century Power Glove; with the Bcon, you’re getting pinpoint motion accuracy and the ability to input precise commands with ease. If you’re looking for a way to get a quite literal leg up on the competition, I can think of no better controller for the job. 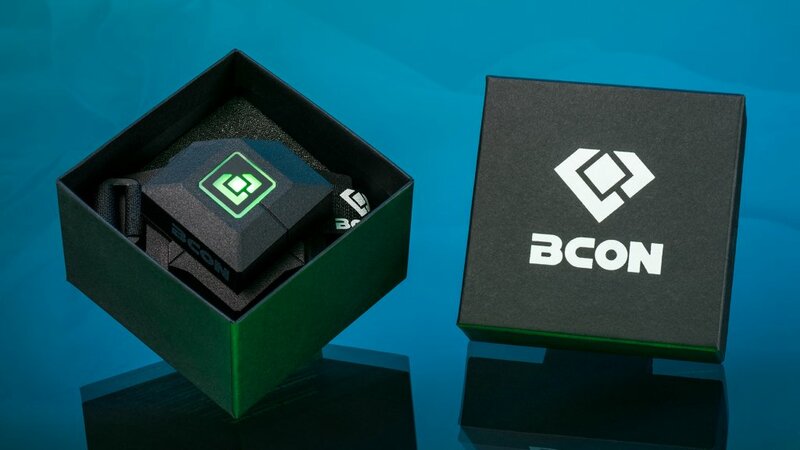 The Bcon Gaming Wearable gives you more control over your games, giving you customizable motion controls as simple to use as tapping your foot.